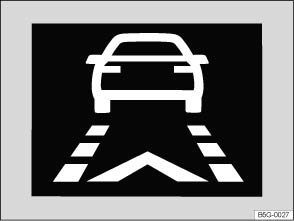 If the safe distance to the vehicle in front drops below the minimum level, a distance warning will appear in the instrument cluster display (close-up). 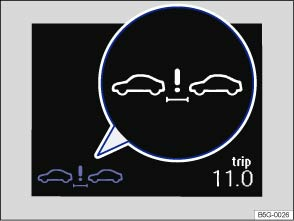 The system detects a potential collision with a vehicle in front 1). Brake or take avoiding action! Depress the brake pedal if necessary. Failure to observe illuminated warning lamps and displays can cause accidents and serious injuries. Never ignore illuminated warning lamps and displays. When Front Assist is switched on, the display in the instrument cluster can be overwritten by displays related to other functions, e.g. an incoming telephone call.